Rayman Raving Rabbids marks the return of the iconic video-game hero, Rayman, in his funniest and zaniest adventure ever. When the world of Rayman is threatened by a devastating invasion of crazed, out-of-control bunnies Rayman must rise up against his furry foes to foil their wicked plans. Utilizing an array of amazing new abilities, and with the help of magical creatures, Rayman must break out all the moves to save his world from these delirious bunnies and their hare-raising antics. Combat the Ultra-Crazed Evil Rabbits – Take control of Rayman and his knack for attack to help save his world from the raving rabbids. They are mischievous, insane and completely out of control. 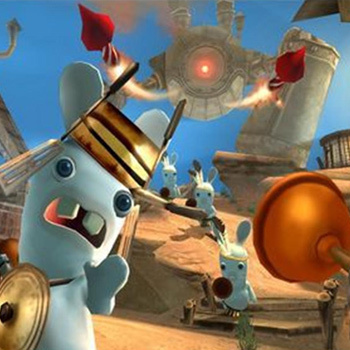 There are several types of rabbids each with its own mischievous characteristics. Tame and control various creatures such as sharks, eagles, rhinos, spiders and angelfish. Rayman can master each animal's unique capabilities to help in his battle against the devious rabbits. Customize and disguise Rayman. Go punk, pop, rock or hip hop to infiltrate the bunnies and foil their devious plans. Explore amazing free-roaming environments and beautiful epic landscapes that mix real and fantastical styles to create a visually stunning experience.